Disseminated intravascular coagulation ( DIC) may present with microangiopathic hemolytic anemia as well as bleeding and clotting/thrombosis at the same time. 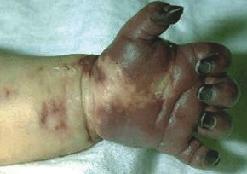 DIC may manifested as petechiae, bleeding from the venipuncture sites, pupura or ischemia of the toes and the fingers. Disseminated intravascular coagulation ( DIC) commonly present in cases of embolism of amniotic fluid or placental abruption ( part of obstetric complication). Disseminated intravascular coagulation ( DIC ) may also present due to the effect of hemolytic transfusion reaction, cancer , trauma or gram negative sepsis. Disseminated intravascular coagulation ( DIC) is treated with transfusion of platelet with some combination of the heparin. Laboratory blood investigation may reveal schistocytes and thrombocytopenia in peripheral blood smear/blood film, decreased in the level of platelet, elevated level of the D dimer, prolonged prothrombin time, prolong thrombin time, decreased fibrinogem amd prolonged bleeding time as well as prolong partial thromboplastin time. Coagulopathy of liver disease which is treatable with vitamin K may also present with laboratory result of prolonged bleeding time, prolonged thrombin time, prolonged partial thromboplastin time and prolonged prothrombin time. Pathologically, disseminated intravascular coagulation may be presented with microthrombi in the vasculature of multiple organs. The excess activity thrombin will lead to activation of the fibrinolytic cascade, coagulation and formation of microthrombi which will finally lead to consumption of the fibrin, clotting factors and platelet which lead to bleeding. 1.Bick, R L, and L A Kunkel. “Disseminated Intravascular Coagulation Syndromes.” International Journal of Hematology 55, no. 1 (February 1992): 1–26. 2.Levi, Marcel, and Hugo ten Cate. “Disseminated Intravascular Coagulation.” New England Journal of Medicine 341, no. 8 (1999): 586–592. doi:10.1056/NEJM199908193410807.